If the smartphones in our pockets are exponentially smaller and more powerful than the laptops that used to break our backs, couldn't we squeeze a computer inside a mouse? I know what you're thinking; what's the point of doing that? But ask not "why", but instead how? The creators behind the Mouse-Box believe they've cracked it, offering up a concept design that does a fairly good job of arguing why such a device could be useful. Detailing a reasonably chunky mouse, removing the Mouse-Box's outer casing would reveal a quad-core 1.4GHz ARM Cortex CPU, a Wi-Fi module, 128GB of storage space, motion sensors and connections including microHDMI and USB 3.0. 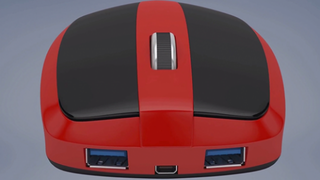 With a battery pack that could power up using an inductive charging mat, the mouse could theoretically be loaded up with an operating system of your choosing, and then be connected over the microHDMI port to almost any display. If you'd need a bag to lug your laptop around in, you'd need just a pocket to transport your entire desktop with the Mouse-Box.